Holy crap it was cold over night. I knew it was going to be cold but I figured I was prepared for it… sort of. I woke up several times in the night curled up in the fetal position inside my sleeping bag. Otherwise I slept great! After filling topping off my water bottles I applied a little moleskin and tape to keep it in place. With the morning chores out of the way it was time to climb back up to the AT and continue on my way. I started the day feeling very, very positive about making it back to my Jeep by the end of the day. If I had paid more attention to the topography along my route I would have been much less positive. 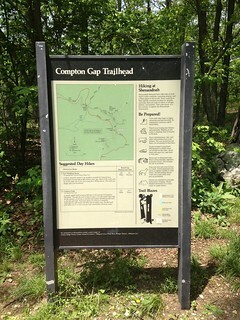 My legs were screaming when I reached the intersection of the AT and Dickie Ridge trails just past Compton Gap after 9.7 miles or so of hiking. Not having carefully studied the topography of my hike I mistakenly assumed that the final miles where going to downhill… oh, how wrong I was. To be fair, the first few miles of the Dickie Ridge trail were relatively benign, almost pleasant. Almost. The sights were certainly pleasant enough but the pain in my legs was working hard to distract me from the scenery. 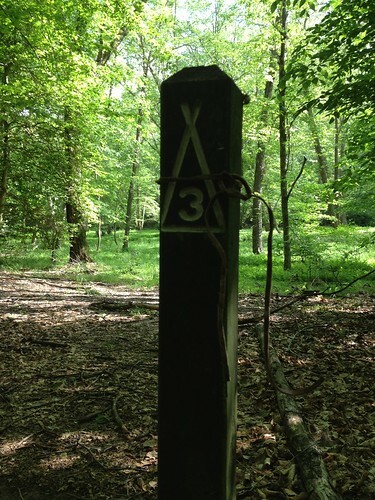 I was in the final phase of my hike and words “death march” where starting to leak into my line of thought. On the bright side I was moving so slowly that I had plenty of opportunity to enjoy the scenery as I walked up and over Dickie Range. I don’t know how fast I was walking at this point but it felt like a fraction of a mile per hour. My legs were stiffening up to a point where my walk was really more of a slow painful shuffle. At one point while I was crawling up Dickie Ridge there was a commotion in the bushes to my right. When I turned expecting to see a deer I was a black bear shimmying up a tree between 20 to 30 feet away from me. To say that I was alarmed would be an understatement. Fortunately it seemed like the bear was just alarmed as I was and i was able to keep shuffling up the trail without needing to use my bear spray. I wish I could say that I strode into the Dickie Ridge Visitor Center but truth be told it was move of a limp. It felt amazing to collapse onto a bench though and stare out at the amazing view knowing that I survived my first big hike on the AT and learned some pretty valuable lessons along the way. Hopefully my next trip will end with slightly less pain! 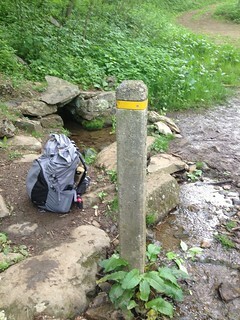 After months of planning I finally got up the nerve to take my first steps along the Appalachian Trail. The plan was to tackle the trail northbound starting at Thornton Gap and ending at the Dickie Ridge Visitor Center hiking the roughly 27.4 miles in three days/two days. Monday morning I caravanned to Shenandoah National Park with my brother and sister-in-law. I left my Jeep at the visitor center and then hitched a ride with my brother down to the Panaroma comfort station at Thornton Gap. 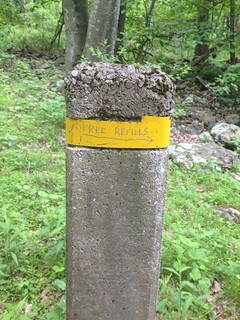 I admit being a bit nervous as I took my first steps onto the AT. Prior to to starting out I had never hiked more than 8 miles in one day much less attempted a long of night hike. As I started out I had a little silly thoughts like whether or not I was going the right way and whether or not I was going to make it back to my Jeep 27.4 miles away. Starting at any place with Gap in its name should clue you into the fact that a climb was in my near future. Start at 2,307 feet the two mile climb to the summit of pass mountain takes you to 3,052 feet. It was pretty cold Monday morning but 10 minutes into the hike I had to strip off my jacket. The first two hours of my hike were blissfully quiet and I didn’t run into another human until Beahms Gap Overlook (3.4 miles into the hike) where the trail crosses over Skyline Drive before heading back into the woods. 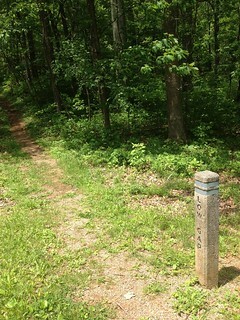 Not far beyond that I ran into my first spring on the trail (see picture above). 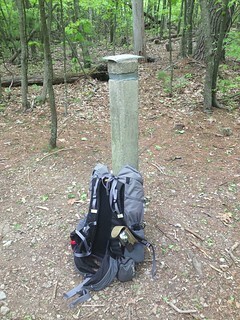 At 12:30 I reached the intersection of the Thornton River trail 5.8 miles into my hike (that’s 5.8 miles in 2 hours and 40 minutes of hiking, much faster than I had figured on doing). At this stage of my hike I was feeling very positive about my progress and was really enjoying the hike. The next major milestone on my itinerary was the Elkwallow Wayside 8.5 miles down the trail where I planned on getting a cheeseburger and french fries at the grill. The 2.7 mile hike to Elkwallow was mostly pleasant up until the last half mile or so climbing up to the Wayside. After 8 miles on the trail my legs were starting to get a little tired, my stomach was starting to rumble, and a cool drizzle began to fall. Walking into the wayside was a bit of a shock after being almost completely alone on the trail. 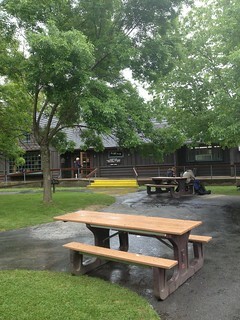 The wayside was pretty chock full of people buying lunch, souvenirs, and generally getting out of the rain. After getting my cheeseburger, french fries, and soda, I found a spot out of the rain where I could sit and eat in relative comfort (as comfortable as sitting on concrete on the ground can be). There were a couple of through hikers sitting near me who shared some trail stories while we waited out the rain. After hanging out for about 50 minutes it was pretty clear that the rain might keep going indefinitely and I had to hike at least one or two more miles on to reach a suitable place to camp for the night so it was time to head out again. Unfortunately, as it turns out, the first two miles or so were a steady climb up to Sugarloaf and Hogback (a gain of about a 1000 feet in elevation although it seemed worse at the time). I finally pulled up for the night after roughly 13.1 miles on the trail between the intersection of the Keyser Run Fire Road (13 miles) and Skyline Drive (13.2 miles) and ventured off trail to make camp. 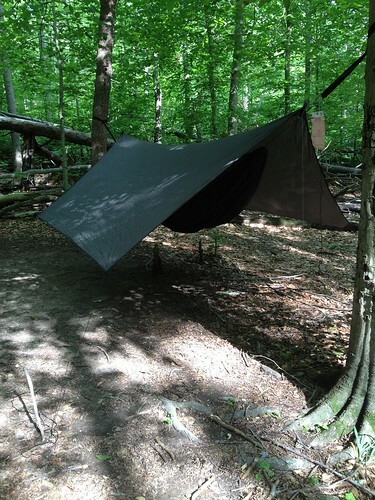 Monday afternoon I ventured out to the Chopawamsic Backcounty Area of Prince William Forest National Park to break in my lightweight camping gear and Northwoods hammock. 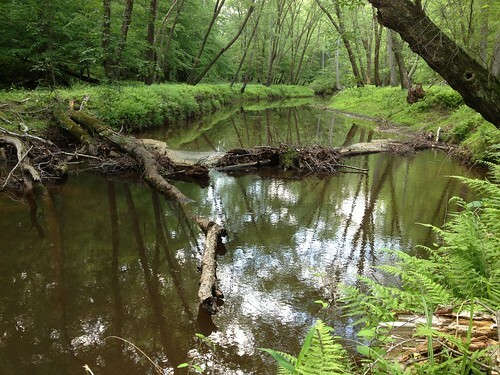 The Chopawamsic Backcounty Area is 1500 acres of backcountry with 8 camping sites. To access the backcountry you need a camping permit and key that you can obtain at the park visitor center for free (you still need to pay for your park entrance). The backcountry is separate from the park proper (find it on Google Maps). To get there you leave the park and drive a few miles west on Joplin Road then turn on to a dirt road and drive another mile or so until you reach the gate that takes you to the backcountry parking (which unlocks with the key you get at the visitor center). Access to the 8 camping sites is from a two mile loop that starts and ends in a small parking lot with an ancient port-a-potty. When you check in at the visitor center they will ask you which one of the 8 sites you plan on camping at and put that down on your permit so you should read the descriptions of the sites before you or ask the staff which they recommend. I originally picked site number 2 because the description suggested a great view. 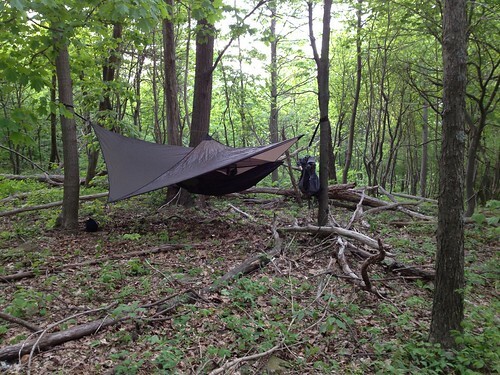 When I hiked up to site 2 (and I mean up, the side trail to site 2 is pretty steep) I discovered that there wasn’t really much of a view and the trees weren’t really ideal for hanging a hammock so I headed back on down the hill and on to site number 3 which was pretty much perfect. Since I was the only person in the backcountry that evening I was able to call the visitor center and let them know I was changing sites (important information in case of emergency so they know where to find your body). This was my first time spending the night in a hammock so I took my time setting things up and playing around with the rigging. I paid extra attention to the tarp because the the weather forecast was telling that there was a 65% chance of a thunderstorm in the evening so I wanted to be sure I had some place to hunker down. Fortunately, although it was very humid, the thunderstorms missed me. Otherwise I slept fairly well. I woke up at one point in the middle of the night with a hyperextended knee. I’m not sure how to avoid that happening since I tend to move around a bit in my sleep. I also discovered that a pillow would make a great addition to my kit. Physically I felt great when I got out of the hammock in the morning. Better actually than most mornings when I roll out of bed. 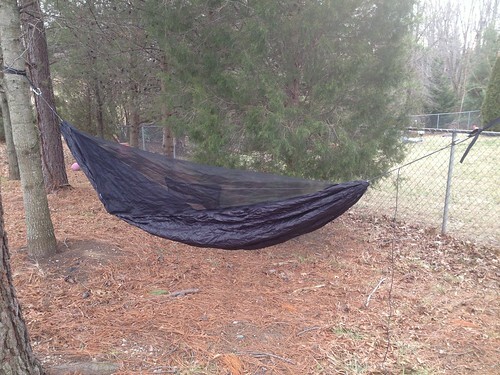 I could definitely get used to sleeping in a hammock. Overall I am really happy with the outcome of this trip. My goal was to try out a whole bunch of new hiking/camping gear that I had never used before and build the confidence I need to take it out on to the Appalachian Trail. On top of a successful test run I got to enjoy a night in the woods without having to travel far from home. The Chopawamsic Backcounty Area is beautiful and well worth a visit.